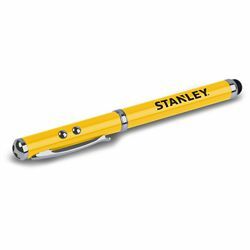 The STANLEY® 4-in-1 Pen Stylus eliminates the hassle of filling your pockets with so many of those small but important on-the-job tools. It includes an LED flashlight, laser pointer, ballpoint pen and touchscreen stylus. Convenient, lightweight and durable, it's also an ideal addition to any toolbox of emergency kit. Requires 3 LR41 batteries. BUILT-IN STYLUS - Keep your phone free from fingerprints with this soft, scratch resistant rubber tipped stylus. INTEGRATED LED FLASHLIGHT - Light the way with a simple click. The high-power flashlight provides a strong beam of light to keep you out of the dark. LASER POINTER - Instruct with pinpoint accuracy as you call attention to important information. BALLPOINT PEN - Take notes with a built-in ballpoint pen with smooth, gliding action. DURABLE ALUMINUM CASE - This multifunction tool is housed in a rugged aluminum case designed to stand up to years or wear and tear.